This month’s challenge is hosted by Kelly of Sass & Veracity, and Ben of Whatâ€™s Cookinâ€™?. Thanks a lot guys for picking up this challenge. When I first read this challenge, I thought they had done spelling mistakes and instead of bread, they had written braid, then soon realized how stupid I was. I just searched Danish braid in Google and there were hundreds of results. It looked so impressive that I had to try it immediately. Yes, I actually tried this very early, in the first week itself. First try – I absolutely had no difficulty in getting this right. I had a big batch of strawberries with me. So I tried this with strawberry filling. This is very time consuming recipe, so it took me most of the Saturday. 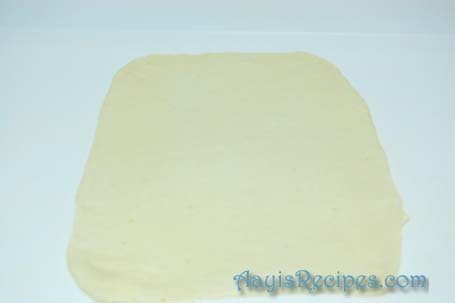 One good thing I had done is, when the dough was resting for the first 30mins, I made the filling and refrigerated it. 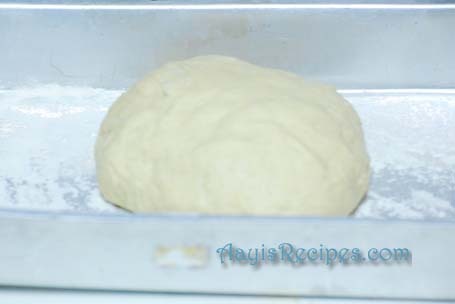 So by the time the dough was ready, the filling had completely cooled and was very thick (which is very important for the braid). I had made only half the quantity given in the recipe. All the time, I thought the yeast may not work and it may become a failure. Considering the time I had spent on it, I would have really freaked out if it had failed. So in the last stage, after 5hrs of waiting and making the braid, when it proofed well and doubled in volume, I almost danced with joy. Then I baked it, my entire house was filled with heavenly aroma. It was just out of the world delicious. I absolutely enjoyed the filling too. Second try – In our office, we have “cook outs” every once or twice in a year. Though all of my teammates know my craze for cooking, I never cooked anything for them (apart from the chocolate cake which was tasted by only a few). This time I knew there will be many more at the lunch. Even though there are some who like Indian food, I am not comfortable cooking it for someone who don’t know much about it. I am not comfortable in cooking anything non-Indian for the fear that it may turn out to be disasters (Actually I didn’t want to spoil my image you know, they think I am a great cook and I would love it to continue that way). 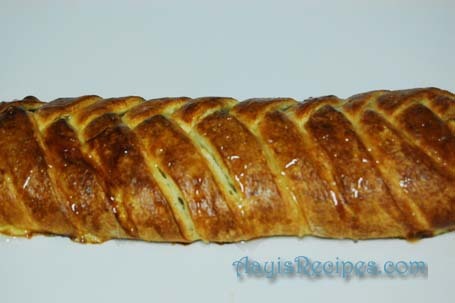 But since I had loved the pastry so much, I decided to bake this for the lunch. I didn’t go with the strawberry filling, because again, for the fear that it may not be something they would love. I decided to make it with apple filling given in the recipe and even though I don’t like cinnamon in sweets and hate everything that has apples in it, I thought to go with it (because I have seen this apple-cinnamon combo so many times on Food network, so I realized everyone would love it). This time I had made full quantity given in recipe. 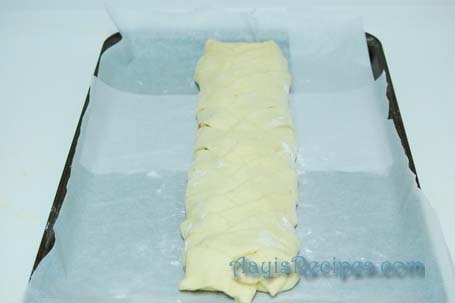 Also, used orange zest (the first time, I used lemon zest) in the pastry. Everything went well this time too. But only problem was, the time constraint. I had prepared the dough on Thursday evening after office and on Friday morning, I had to bake this early morning and reach office by 8AM. I made one big and one smaller braid from 3/4th of dough. So things became a bit too tight that day for me. In a hurry, I baked it for a tad bit longer and it came out bit darker than I would have loved. But it still smelled amazing. Everyone at the office, loved it :). I was so happy. It was gone in minutes. I had kept aside 1/4th of the dough. 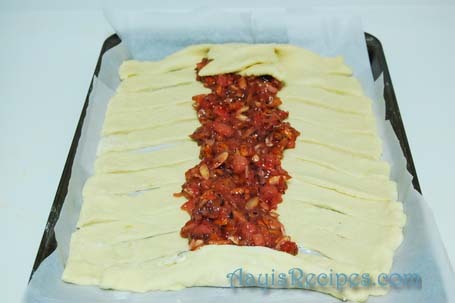 I made a small braid with it for a get together at home with my favorite strawberry filling. 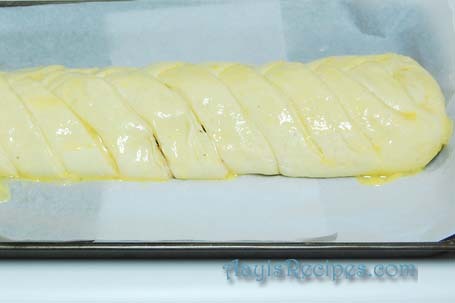 This time, instead of egg wash, I coated the braid with butter – because my guests don’t eat eggs, even though they said they don’t mind the eggs in pastries/cakes, I didn’t want even the eggy smell to pastry. This time, the filling was a bit watery, so the braids didn’t come out as expected. Even then, it was amazingly tasty. 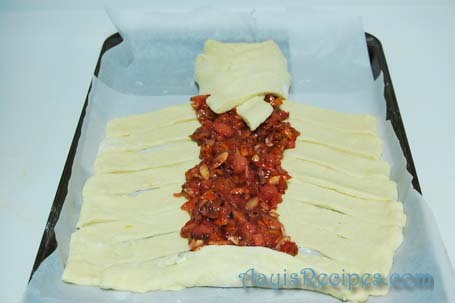 I was going to make a savory braid again before this post with a savory filling. But since I was not keeping very well for last couple of days, I could not manage that. Anyway, I will do it sometime in future. 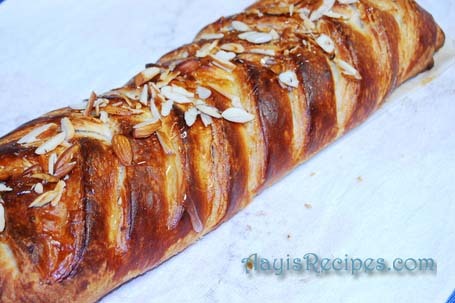 Click here for the recipe of Danish braid. – Please follow the instructions exactly if you attempt this. 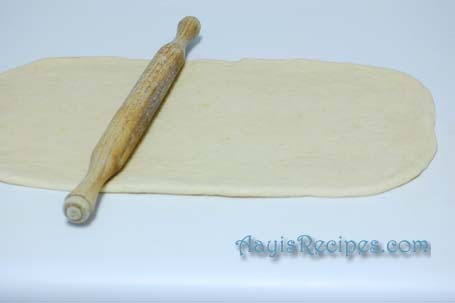 Do not skip/change any of the steps of making the dough. Once you get hold of it, you can experiment with it, but first time, please follow exactly. – The filling should not be watery, otherwise the braid opens up after proofing. So make it in advance and refrigerate it. – Room temperature makes a difference too. My kitchen temperature remains at 70-80F all the time because of air conditioner. 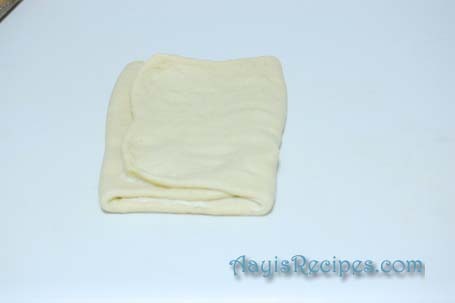 – Remember, the yeast needs activation(if using active dry yeast) before using in this recipe. Leave the yeast in lukewarm water for 10mins allowing it to activate. Then continue. 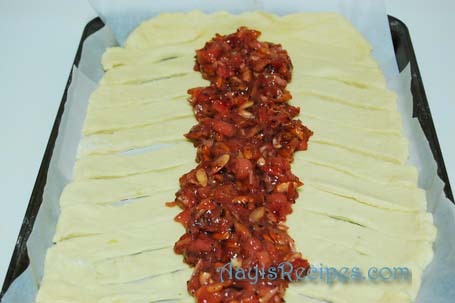 Strawberry filling – This quantity is enough for half the quantity of the dough. The braid comes out huge and easily enough for 6-7 people. The nuts give a crunch and great taste to the filling. I loved the cardamom flavor of this filling very much. 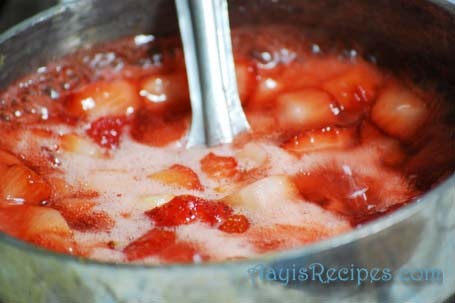 Take strawberries and sugar in a heavy bottomed pan and cook on medium flame till the sugar is melted and become slightly thick. Now add corn starch, a little at a time mixing all the time. Take off heat and add cardamom powder. In another pan, melt the butter. 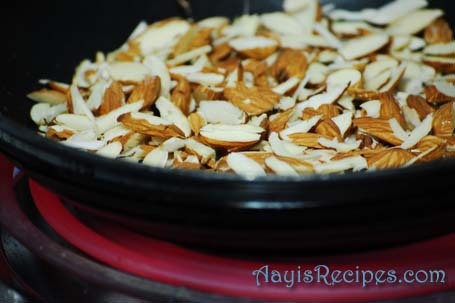 Add chopped almonds and fry for few minutes. Add the almonds to strawberries. Mix well. Cool to room temperature and refrigerate for few hours before using. Wet ingredients poured into the dry ingredients. 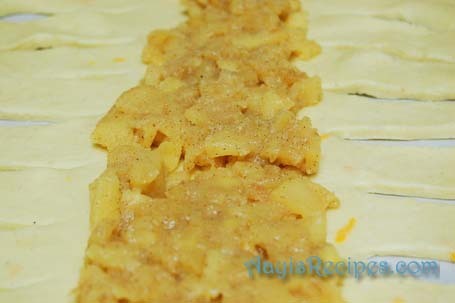 In the dry ingredients, I used lemon zest instead of orange. 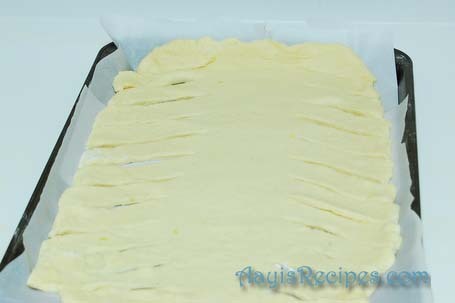 Butter cut into pieces before beating for the butter block. I forgot to apply egg wash before leaving for rising. 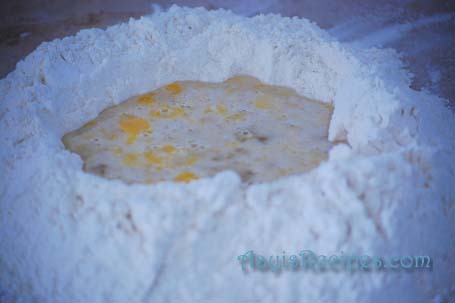 So here the dough has already risen and then I applied egg wash. I am posting everything I know about this recipe. This point is for those who have been attempting Daring bakers recipes from here, skip/change some steps and say it did not work well for them. Remember, these recipes need some patience and expertise. When I made these, I was in one of my best moods and had reserved a lot of time for it. I am also a novice in this and just learning. Update: For those who are worried about the butter quantity, if you calculate it properly, it comes to around 1tbl spn of butter per huge serving. 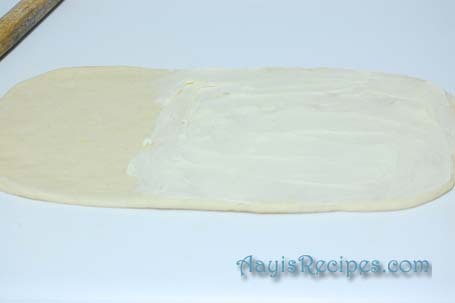 I really don’t think it is too much because if you buy pastry sheets from market, they have too much of butter in them (which usually drips when you bake them). You won’t be eating this daily, so once in a while, I think so much butter is not too much. What a lovely looking pastry. Worth the effort i think……….. book marked, and I will try it soon. Thanks for such a detailed post. Hey Shilpa, this pastry looks amazing. I think the braiding looks perfect and love the chopped almond effect you have done on one of them. I think I would love both the fillings you have here..Yummy.. Your braids look great, and I love the step-by-step photos that you took. gorgeous braid. i love apple fillings, but can’t stand the cinnamon in it. i’ll try a whole wheat version. 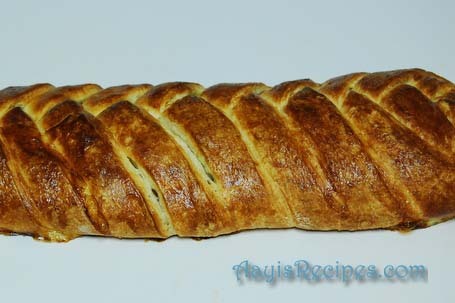 lovely braid, I too was thinking about the apple filling but at the end I am now in love with it. Hats off to your patience. The pastry /bread looks so gorgeous. Mouth watering. Shilpa , thanks for the step by step instruction,it is very clear and nice. looks lovely, must have tasted great as well. would love to make it, but am worried about the zillion calories 🙂 do u know a low cal version? Awesome awesome! This is just one grand looking challenge. Glad you are enjoying these challenges and i love chatting to you about them! 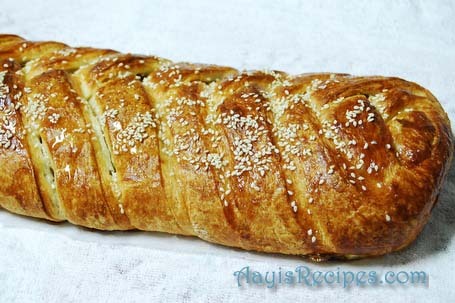 amazing shilpa…the braid pastry looks delicious and simply out of this world..i don’t think i will ever have the patience to attempt something so complicated! !amazing..fantastic and fabulous..three cheers to you!! Two braids in one month… I *am* impressed (and glad you decided to stick with us). Definitely try a savory Indian filling and let us know how that turns out. You made this twice and planned on a third one? Wow. Your braids are looking very good. The recipe link doesn’t seem to be working… the pics are amazing! Shilpa: Thanks a lot. Updated. Your co-workers must have been very impressed indeed! This looks yumm…………and your detailed explanation is mind blowing….Keep up the good work. You have inspired me to start my own blog. I have been reading many of the daring bakers blogs about the braided pastry. I personally think that strawberries make the best pastries. Thank you for sharing your adventure with us. Shilpa..wonderful and its reflecting so much of efforts ya! (Am in Mumbai and today only signed in!I truly miss the blog world but enjoying here as well) Great work and it looks amazing the braids n the stepwise snaps. beautiful job on that. I love the toasted almonds on top. Your braids look wonderful! I love how you have photos of each step as you worked through the braid process! I have to say that you braid so nicely! It’s perfect. Your pastry is awesome and I’m sure it tasted even better. Great job! Your braid looks beautiful! i like the sesame on top instead of icing. I also am not crazy about overly sweet pastry but this was really good. Kudos to you and your cooking patience…. Gosh I was drooling on the comp while I was going thru the recipe. Great job! This would be interesting with an Indian filling…I’m sure you’ll come up with something wonderful. Wow Shilpa, you are really a daring baker Shilpa,wow looks like one from a bakery,and your patience is admirable. 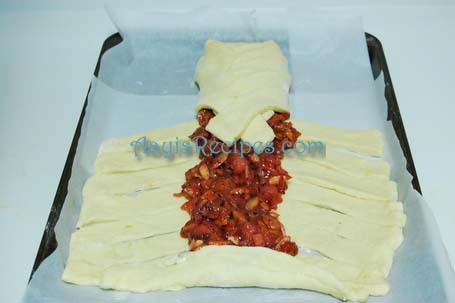 Hi Shilpa, I’ve seen this preparation as part of the Daring Bakers challenge 🙂 But this is one of those blogs with step by step pics so I really liked it 🙂 Thanks! And oh yes, congratulations on your successful completion of the challenge! The results are mouth-watering! 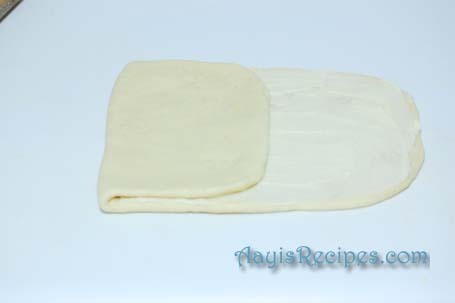 i really appreciate your patience to roll out that dough… just to make things a bit easy…can we use the ready made puff pastry sheets that we get in supermarkets? Shilpa: Sowmya, you can use the ready made. 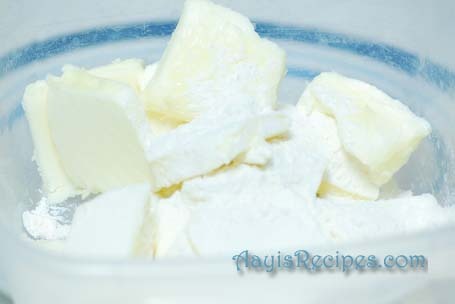 But this one is more flavorful and also more healthy as the ready made ones have much more butter. This dough freezes well. So if you wish, you can make a big batch and freeze it and use when required. thank u for such gr8 recipe!!!! i wish i had a piece of it to taste…may be next time…. You are amazing.. this is simply superb.. Great job!!!! Your braid turned out beautifully. I will try the recipe with chatpata chicken bhaaji filling . What a lovely braid, Shilpa! You make it sound easy. 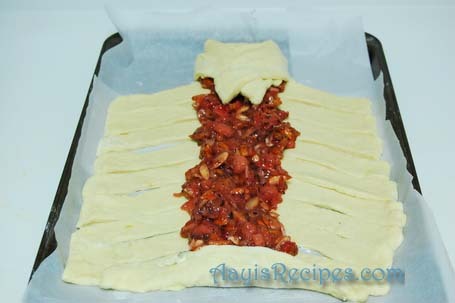 Your pastry and braid are perfect! I absolutely love this recipe. I have always wanted to bake my own bread but have been a bit scared to take the leap. This looks time consuming but so well worth it. You have done an amazing job. I am going strawberry picking so this would be a great recipe in which to use my strawberries. Thanks for this post. With this braid recipe, you have achieved amazing results. Brushing the top with milk gives a glossy finish too…just saw that on Food Network. 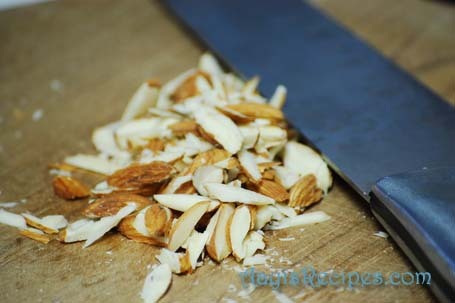 I’m a senior newbie who has just started a cooking blog: http://paytpooja.blogspot.com. When you have time would you please visit and leave a comment? It’s me, Geeta (Aunty) again. What a great recipe you have made/followed here. I am going to mention it on my site with a link to yours…as Most Challenging Recipe Followed Perfectly. Congratulations on these great results…hats off to you. Im at just amazed at how beautifully you have captured all the photographs explaining it step by step. I just wish i could sink my teeth in it right away. That’s brilliant – looks amazing. Got to try this one ASAP ! Beautiful and so painstakingly explained – thanks so much Shilpa. you really inspire the rest of us to try! omg…..!! !this just too gud to be true…i mean this is totally a pastry shop experience for me…u’ve done a brilliant job to get this beauty on screen…for all of us sweet tooths here…my mouth’s watering….great job!! hi shilpa…am making the braid as we speak! am onto my second turn now! have a question though..how long after we fill the braid , do we have to leave it to rise? im hoping u see this before i bake mine! Shilpa: About an hour till it rises and foamy to touch. i didnt activate my yeast! 🙁 im hoping it rises all the same.. Please let me know about the timing and the temperature used for this recipe. I would definitely try to make this pastry? Have you also tried making scones, danish miniature pastry, choux pastry,cream puffs, choux eclairs, petit fours or any miniature pastry? Shilpa: Every detail is in the recipe attached. What a lovely blog, Shilpa! This recipe has made me want to break my diet (again) and go back to baking! Shilpa “Happy Diwali !!!”. A very, very nice recipe. All the best!! Hey,whether corn starch & corn flour is same? Shilpa: No, they are not. Check this out. So the difference is only in thier taste.I do have corn flour with me.Can i use that with this recipe? Shilpa: I don’t know. Sorry. 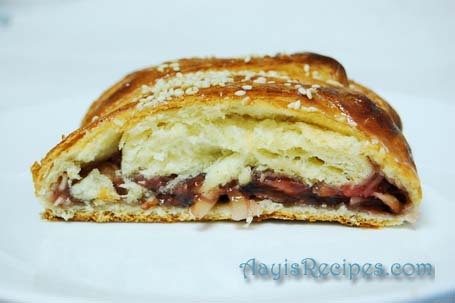 Lovely recipe,i gonna try it 2day,just wanted to ask u,Till how long it’s good to use strawberry filling after making? Shilpa: I haven’t tried keeping it for more than 3 days. I’m about to make this bread and I have a question about the yeast. Do I need to measure out the required amount for the recipe before or after I activate it? I realize the volume is greater after adding water so I want to make sure Im not using too little or too much. I assume I would measure out the tablespoon of dry yeast and activate that; but then I think that the amount doubles once I wet it and then am I using too much? I fyou can please let me know! Thanks! Thank you for answering so quickly!! I can’t wait to make this. My danish braid was yummy..thanks to u..:).I would like to know whether the left over strawberry filling can be frozen for later use? I haven’t tried freezing it. But I think it should be good. i was searching for konkani veg recipes n eventually found ur site..simply superb how u show each n every step through pictures…it really inspires me.. 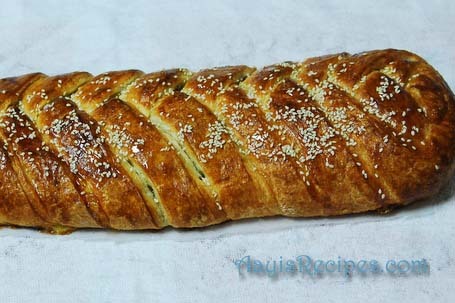 I recently made this Danish braid using your recipe posted here. I want to post it on my blog with original source of recipe. I will use a link to link your recipe. Please let me know if this is okay. Also can i just use the recipe listed on your site on my blog for future reference for me ? I am a fan of yours….and was planning for a very long time to make this pastry but I was nt confident enough.Today just now I made it & am so happy that could not resist to share it with you at 11Pm :P..Braid was not perfect looking as yours though it is good looking enough hehehe & tasted great too.Thank you so much for this recipe. it blog has become my favorite pasttime these days.totally love it,why don’t you upload some of ur recipies on you tube . love the presentation of the recipies in ur blog.